I’ve joined two charm square swaps. The first is the the Let’s Get Acquainted I-SPY Swap, for which I’m sending two sets of blocks, one of moons and stars and the other of bananas. (If you’re interested, it’s still looking for more people!) 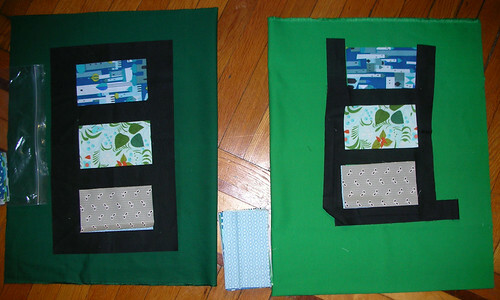 I’m planning on making a quilt to donate to a children’s charity with the squares I get back from this swap. 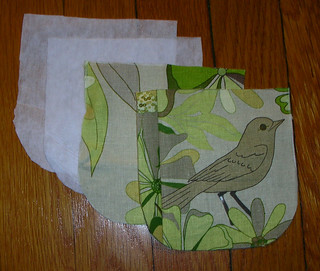 I’ve just started a handbag using the pattern Mabel, by Jenna Lou Designs, which I found through Purse Palooza 2012 on Sew Sweetness. I’m going to try to make an altered one with an internal dividing zipped pocket, so I figured I should make one following the pattern as written, first. I’m using scraps from the Mixtape Quilt. 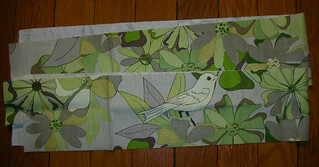 They ended up being cut sort of sideways, so the birds are all facing the wrong direction, but I think that will be all right in the end. It’s a good test case for getting used to working with interfacing, which I have not used before. Of course, I only ordered the magnetic snaps and strap hardware today, so I’ve pretty much gotten as far as I’m going to get until it arrives. Maybe I’ll work on putting in an interior zipped pocket on one side and appliqued, open pockets on the other, just so the bag will hold something useful and not be an enormous black hole of stuff. It’s mostly a test case for a potential knitting bag, so I think I’ll try out pockets from this knitting bag, putting the outside pockets on the lining of the Mabel bag. We’ll see how it all works out! 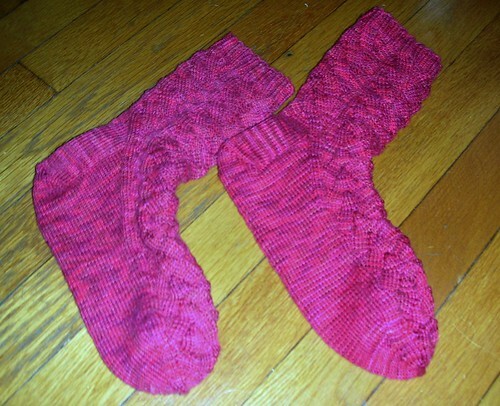 Finally, I finished my red monkey socks this week. They ended up being too small for me, and there wasn’t enough yarn to finish them even if the ankles hadn’t been too narrow, so they’ll be a gift for a friend. The friend I’ll be giving the socks to is further along in her PhD program than I am, and she’s writing her thesis, so we meet about once a week and study together. It’s a really good system for me, because having someone else around helps me focus and keeps me from spending too much time surfing the web, or knitting or quilting or otherwise putzing around. It works surprisingly well. I’ll cast on a new pair of socks this weekend or early next week, using a Malabrigo sock in the “Persia” colorway. 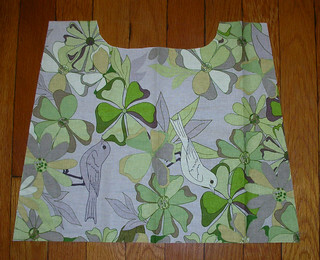 I’m not sure about the pattern yet: something with some stretch to it, and an easily memorizable repeat.